Which level of availability do you expect for your website or application? Among others, it depends on the technology you want to use, the importance and the impact of your website or application, and the investment that you wish to make. Nucleus makes sure that your website or application stays online. Yet, we provide different levels of availability for different challenges. Because not every project is equally critical, not every company uses the same technology, neither does every company have the same budget. We’d be happy to assess together with you which solution suits your particular organization best. 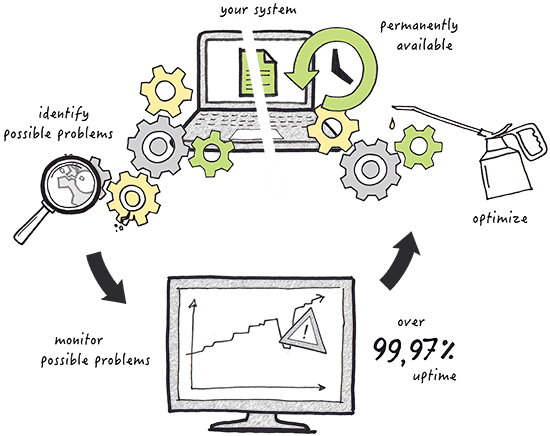 You want your website to go live quickly, with a good uptime? We offer you web space on a shared server in our public cloud. We make sure you have the highest availability as possible. The renting of a dedicated server is an ideal solution, in particular when you work with business-critical applications. Our data centres belong to the best in Belgium. Therefore, we guarantee an availability of 99.50 per cent. When your operational management and processes strongly depend on the availability of your server, then we recommend “high availability”. This is a cloud hosting solution that guarantees an availability of 99.97 per cent. Do you require more than 99.97 per cent availability? Then we will work together with you on a multi-datacenter solution. Modified to the specific wishes, needs and requirements of your organization.